This four-piece set includes everything you need to keep all your parts tip-top shape. Lips, shoulders, knees, and toes—in case you were curious, they all deserve care, and this four-piece set includes everything you need to keep them in tip-top shape (and by that, we mean ridiculously relaxed). 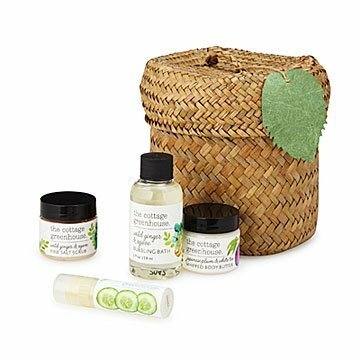 From Wild Ginger & Agave Fine Salt Scrub for buffing to Cucumber & Honey Nourishing Lip Repair blended with extra virgin olive oil, vitamin E, and rosemary, each one of these soothing concoctions is free of parabens and phthalates… and free of animal testing, of course. Take them on your next adventure, too—they're travel-size. Enclosed in a charming, reusable basket for hassle-free gift giving, this set is one sweet way to say "thanks" or "love you" and "now, take a moment to care for yourself." Designed by Margot Elena. Made in Denver, Colorado. Margot Elena perhaps ran the world’s first “pop-up” shop. She started out making and selling rings to classmates, and by seventh grade, she was selling her wares out of her bedroom. By the time she graduated from college, Margot had saved enough money to open a true retail location, which she filled with beautifully packaged bath and beauty treasures. Now, Margot’s treasures are available worldwide. Inspired by literature, intriguing patterns, and nature’s perfect imperfections, she carefully considers every detail of her products, from the design of the box to the delectable products inside.